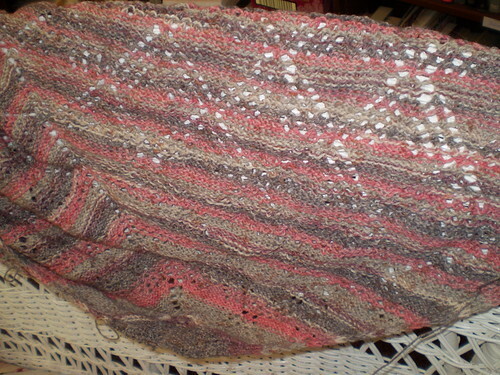 So I'm still knitting along on Alix's Prayer Shawl, which is the name of the pattern and not the recipient. I still love the yarn I'm working with, which is called Austerman Step and is German, so I can't read all the stuff written on the label. Like so many Americans, I'm terribly ignorant about other languages. I love the colors and the feel of the yarn, which is a good thing, since I'm going through 920 yards of it in the two skeins I bought at Mosaic for the project. The pattern....well, it seems I'm losing my concentration. Lots of tinking rather than knitting lately. Can't blame the pattern for that. Nor for the fact that I'm really, really nervous that I'm not going to have enough yarn in the second skein to finish this thing. 920 yards in the two skeins and the pattern calls for less, but it also calls for a thicker yarn. I really like the finer yarn for this, though, so I'm hoping it will work out. Otherwise I'll be onto Mosaic and Ravelry, frantically searching for just ONE more skein!